Recently I visited the part of Warsaw I'd never been before. It was late in the night and we were waiting at the bus stop for the bus to come. And than I saw this poster, which was advertising some language school. When I saw its title I immediately recalled your blog. The title says: "Caiian Method". 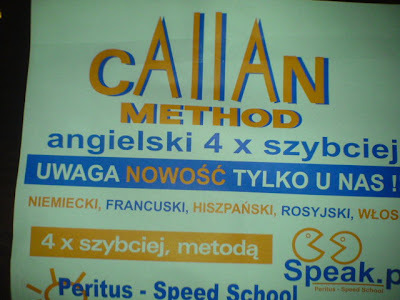 It looks a lot like Hawaiian ;) But they obviously meant "Callan Method" and apparently those lower case L's in the middle seem to have their shape for aesthetic purposes (but still typographically incorrect). Further writing states: "English 4 times faster", "Attention! New! Only with us! ", and so on. I like the speaking Pacmen!